Netvizio | Online Videos. Reinvented. VisioCloud is the world’s first App Store providing apps to augment online videos. Video publishers simply drag & drop the selected apps on top of their videos and publish the augmented videos online. Apps include VOD, live multiparty video debates, videoconferencing, voice/video telephony, call center, 3G video calling, games, quiz, etc. 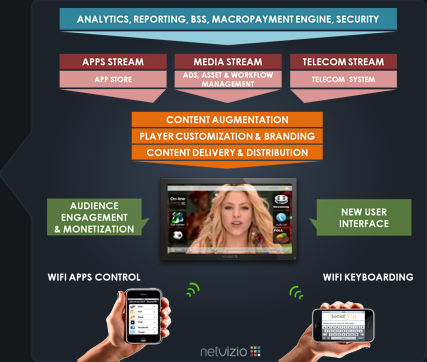 Augmented videos are distributed on any internet connected device through Netvizio’s browser-based player, seamlessly aggregating video streams, apps, telecommunications services, two-way interactivity channels and in-app micropayments. All delivered seamlessly as a full in-player experience. No software installation is required. Publishers can easily monetize content & apps thanks to in-video micropayments capabilities based on premium SMS or 3G voice/video calls. No credit card or account login is required, fostering impulsive purchase. Netvizio delivers to video publishers a cloud-based and end-to-end solution to manage and augment their assets on a single platform. Our platform integrates with major advertising networks and servers, as well as world leading Media Asset Management and Content Management System solutions. 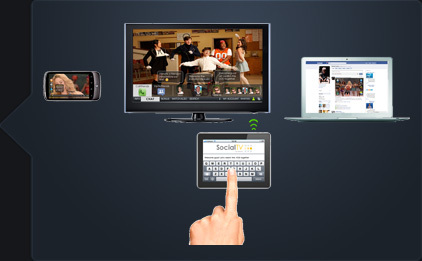 Video publishers can easily syndicate and distribute their augmented content on any internet connected device, including PCs, smartphones and connected TVs. Netvizio’s player, which is native to the browser, requires no software installation, and can run seamlessly the video as well as the attached apps, the premium content and the telecom services. These augmented videos are completely viral. They become a new channel to deliver apps, premium content and telecom services across websites and social networks. How big is my audience? What apps do viewers play most? On which device? Do they share augmented videos on Facebook or other social networks? How much time do they spend on telecom apps? How many premium SMS have they sent for my last VOD? Publishers are then able to take measures to boost engagement, modify in real-time their augmented videos with no need to redeploy them, push live interactive apps and call to actions such as polls and ads overlayed on their online augmented videos. Financial reportings give publishers a clear picture of the financial performance of their augmented videos, including micropayments revenues and advertising revenues per video, apps, region, etc. Deliver new video and interactive IPTV experiences for NGBN networks. Add telecom services to online videos and TVs. Provide App Store-based services to OTT players. Deeply engage your TV audience. Achieve global reach with OTT delivery. Monetize with embedded in-video payments and augmented interactive ads. Create a unique engaging experience for your target audience. Deliver new Ad experiences on PC, Connected TV and Smartphones. Augment Ads with apps & telecom services. 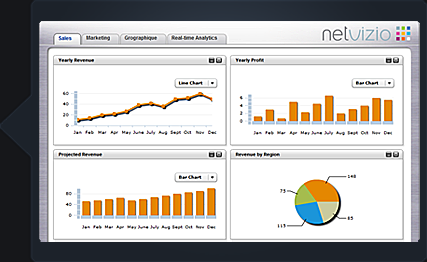 Book an interactive Demo now! OSEO, the French national agency devoted to supporting innovation and company growth, has selected Netvizio's innovation R&D program in 2009 for the development of a content augmentation method enabled with NGN telecom services, and a content aggregation technology on internet connected devices. OSEO supports Netvizio's innovation, investment and international projects over a two-year period. EUREKA is a pan-European initiative uniting 40 member countries aimed at supporting selected R&D-performing entrepreneurs in Europe and beyond. Netvizio has won the EUREKA Innovation label in 2009, demonstrating Netvizio’s innovation capacity in the field of online video augmentation on any internet connected device. This prestigious EUREKA label is an endorsement of Netvizio's capacity to bring to the market innovative solutions enabling video publishers to better monetize, engage and grow their audience. Netvizio is leading a media development research program with the MIT University (MISTI program) and Afeka College of Engineering focused on the development of new generation human-apps interfaces. This innovation program focuses on hands gesture recognition and handheld objects tracking technologies, to interact with Netvizio App Store's applications for PCs and Connected TVs. It specifically studies how to transmit information through hands motion and gestural interaction techniques in an intuitive manner. This research project is key to Netvizio's Stereoscopic 3D program which will immerse PC, TV and mobile video viewers in a stereoscopic 3D world augmented with interactive S3D content. Copyright © 2007-2010 Netvizio SAS. All rights reserved.